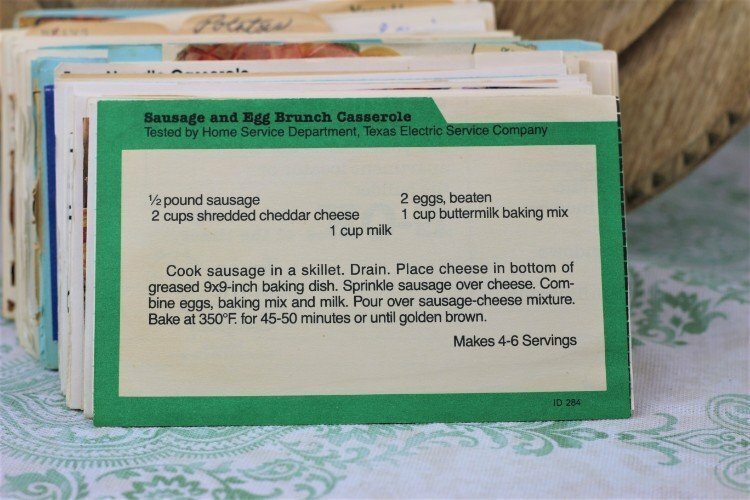 Front of the recipe card for Sausage and Egg Brunch Casserole. 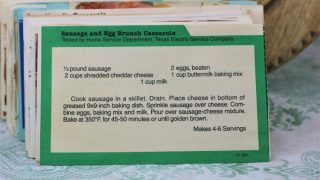 There are lots of fun recipes to read in the box this recipe for Sausage and Egg Brunch Casserole was with. Use the links below to view other recipes similar to this Sausage and Egg Brunch Casserole recipe. If you make this Sausage and Egg Brunch Casserole recipe, please share your photos and comments below! Cook sausage in a skillet. Place cheese in bottom of greased 9x9-inch baking dish. Combine eggs, baking mix and milk. Bake at 350°F. for 45-50 minutes or until golden brown.